Travel Europe by train to cover longer distances. And experience all this spectacular continent has to offer. Departure boards are simple to understand in any language. And you will be surprised how much you can accomplish at a ticket window. See below for everything you need to know to travel Europe by train. The train system in Europe is exceptionally well organized. It makes international travel through Europe amazingly simple. Follow these easy european travel tips on train transportation to make your experience a secure and an enjoyable one. Many airports in Europe are on train lines with trains going into major cities every few minutes. Larger cities usually have more than one train station, such as in Paris and London. Check the name to make sure you are at the right station. Train stations are normally located near the town center. And most are designed to help travelers learn how to get around quickly. You will even find bike rentals in many train stations as well. Public transportation, whether by train or bus, is extremely convenient in Europe. Most locals have no need of owning a car. Southern Europe is easily traveled by train and public transit. In more remote areas, especially in Northern Europe, a car may be necessary. Especially when traveling by train is much too far from your destination. Certain areas and towns are only accessible by car. And that means less tourists and crowds. Italy is made up of 20 regions. These include the cooler areas of the Po Valley in the north to the sultry Mediterranean spots of Sicily and Calabria of the south. Train station ticket windows will handle your reservations, tickets, and sleeping car needs. Departures times and destinations for all trains are visibly listed on a board. Make sure to validate your rail pass here when you travel Europe by train. This is easily done with your passport. Be aware that many faster trains as well as sleeping trains require a reservation. The constantly changing Departure Boards provide up-to-date schedules and are pretty much the same at every train station. You won’t need to learn a new language to understand them. The information is self-explanatory and provides Departure times, Destination, Track, and if your train is On Time. For the longer-traveling trains, platforms provide information on where the trains are headed. You will also see which cars are first or second class and where you can eat or drink something. 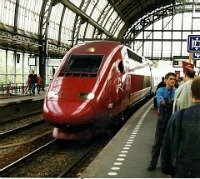 In order to travel Europe by train successfully and with minimal confusion, make sure to locate your train on the platform and its destination before boarding. Reservation seats are easily visible inside. Search for an empty compartment with no reservations posted for a more private ride when you travel Europe by train. All trains are clearly marked for First and Second Class. And many trains have open seating as in a bus, although some still have the traditional compartments we so often see in movies. Train stations at bigger cities are typically crowded. Clearly posted departure times and platform numbers make transferring trains easy to follow. Use the express trains for traveling from large city to large city. Use local trains for travel to and from the smaller cities. These are just as easy to find and use. You will be amazed at how simply you can get from city to city...and country to country. Use simple strategies for traveling affordably like staying at hostels or bed and breakfast inns. They are cheaper and are common in Europe and South America. And take advantage of public transportation instead of taking a taxi. Get more tips here. Keep international travel safety in mind at all times. If you travel Europe by train, keep an eye on your travel bag. Petty thieves are notorious for stealing bags from unsuspecting tourists. Attach your travel bag to a rail. When sightseeing between hotels, leave your bags at the train station. Most stations have coin-operated lockers that are safe and simple to use. There is no need to lug around your travel bag. For longer distances consider traveling Europe by night train. They come with clean linen and an attendent who monitors who comes and goes. The cost is about half the cost of a night in a hotel. That way you can rest and be ready for your new destination upon arrival. Keep in mind that sleeping cars do require reservations. Italian Festivals are as varied as the landscape. Watch passionate combatants dressed in costume battle it out in Florence. Or experience the moving religious holidays of Pasqua in Sicily. Choose which dates you want to be a part of. Public Holidays in Italy are taken very seriously. They are enthusiastically celebrated throughout. Be aware there will be closings in many areas. Check specific dates here before traveling to Italy. Traveling Europe by train is a simple and affordable way to get to know this amazing continent. Learn all the ins and outs to get to your destination quickly and safely by following the above tips.